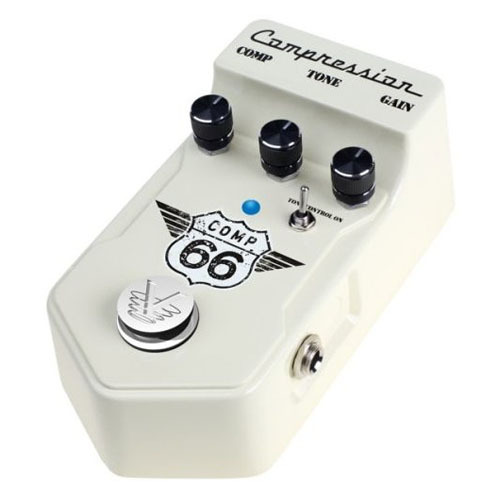 The Visual Sound Comp 66 is a fair take on the Ross/Dynacomp compressor. The construction is sturdy, it’s a die cast metal house with a metal bottom. The three knobs are placed well apart so it’s easy to set them. The foot switch is is a large, shiny knob with the Visual Sound logo. They have changed their company name to Truetone recently. Its “spring” is actually just a piece of black foam, so the action of the switch is a bit light and rubbery for my tastes. The controls are the following: there’s a comp potentiometer for the amount of compression, the middle tone knob is a tilt EQ, turning it clockwise give you more treble and cuts the bass, while turning it the other way boosts lows and cuts the treble frequencies – up to a point of course. In middle position it’s got kind of a “smile” curve, which means the mids are scooped. The third knob is called “gain”, you can set the output level with this one. If you turn down the compression and turn up the gain, you can use this pedal as a clean boost. There is a switch that you can turn the EQ off with, if you do so, the overall EQ will be similar to a regular Dynacomp which is rich in treble, without the scooped mids. The compressor is quite noisy. Not horribly so, but it’s annoying enough, especially since I use it with very low noise active pickups. There is a built in noise gate that you can turn on or off with a little switch inside after taking off the bottom plate, but it’s useless at its lowest – default – setting of the trim pot, and cuts off the trailing end of the notes when set to anywhere higher. The foot switch makes an audible pop whenever it’s engaged or disengaged. It is not true bypass, but it uses a nice sounding, clean buffer. The pedal works with regular center negative 9V DC adapters, or you can also use a 9V battery.